Our Rosario pattern Talavera dinner plate is hand painted with a bold and colorful design by skilled artists in Mexico. 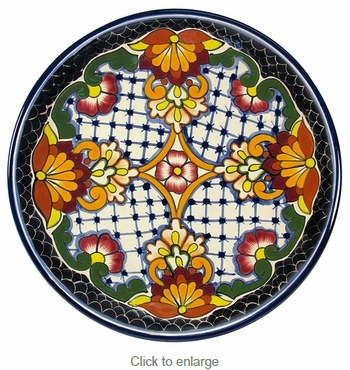 These Talavera ceramic plates are lead-free and safe for serving food and using as dinnerware. Talavera is dishwasher and oven safe. All of our Mexican Talavera dishes and serving platters are hand made and hand painted by Mexico's talented potters. Direct From Mexico will carefully pack your order to ensure it arrives to you safely. Rosario Talavera Salad Plate - 8 inch dia.